Today we'll tackle a rather delicate topic: Should you record with or without effects? Today we will discuss direct recording an electric guitar. This week I will show you a technique that is pretty widespread when it comes to recording electric guitar (but not only), namely: double-tracking! Speaker emulators seem to be highly in demand right now, mainly as a solution to record yourself and play live, benefiting from the sound of a tube amp. There are obviously lots of software tools to do that, but hardware solutions are becoming more and more popular. Today I will show you a nifty trick derived from the previous installment which will allow you to get an quasi-stereo electric guitar sound with two mono takes. In this installment we'll see in which cases it might be useful to record your guitar amp with several mics. 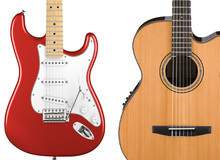 While electric guitars have seen a decrease in sales in recent years, the acoustic guitar market seems to be as healthy as ever. This week we retake the recording of electric guitar with the installment you've all been waiting for: the recording itself! Second installment of the chapter dedicated to recording electric guitar. Today we'll discuss a small accessory that many guitar players are fond of to see how it impacts the sound and how you can make the best of it.